The walls in my spare bedroom "gallery" are a little barer today. I followed up on a contact I had made with a local gallery over the summer, Sonlight Gallery in Fort St. John, and brought ten pieces in for the owner to evaluate, in hopes of expanding my representation outside of Dawson Creek. I came home with one painting. 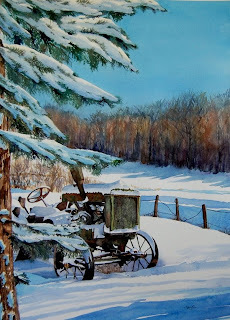 Allan chose four for the Fort St. John store, four for Picture Perfect, his gallery in Grande Prairie, Alberta, and one to scan and possibly make into giclee prints. It was a good day. After my baby-raising break from art, it is the first time in a long time that I have had someone else in a position to actively help me sell my work, who has the resources to do so. That's a real encouragement after so many years of going it alone. I will always be the biggest advocate of my art, but sales in any gallery benefit the owner, and if he's taking it into his (already full) gallery, he must believe that it may sell and will make an effort to see that it does. I'm learning to trust my instincts where my art is concerned. I brought the paintings that I thought would be appropriate for the venue, and just like I thought, the Secrets of the Muskeg series were the ones he was most interested in for the store. Another painting that I brought in, still unframed, was chosen to explore as a giclee print run. I chose a mat and frame for my Luscious raspberry painting - I always get so excited about seeing a piece framed all glamourous-like - and it will go in the Grande Prairie store with three other florals. As I was leaving, I thought to ask Allan about the Capture the Beauty of the Peace painting competition that Picture Perfect holds every year. I'm glad I did - you may remember my post from earlier this year, explaining why I wasn't entering the competition. I've revised my opinion, and I'm going to paint this winter with the April date of the competition in mind. While the prize money isn't equivalent to the value I would place on a painting that size, the winner receives far more than a fiscal award - the publicity potential is high. The reproductions of the painting aren't numerous - while they reserve the right to reproduce the winning art, it's in a very small scale, artist proofs are provided, and the reproductions are not sold but are given as donations throughout the year - to some very well-attended events. Painting for me is only part of the process - the cycle is completed when the painting has sold. While it's a scary thing to approach gallery owners and potential clients, it's the kind of scary that is also a bit of a rush - at least when it goes well! And even when it doesn't, I kind of like the business side of art - though not as much as the creating side!